Players of Gran Turismo will no doubt recognize this as one of the “Porsches” that they get to drive, albeit virtually, due to Porsche’s asinine exclusivity contract with EA. Instead, the video gaming generation became quite familiar with the outrageous products of Germany’s Ruf Automobile. Founded by Alois Ruf, the company began modifying Porsches in the 1970s and the company is recognized as an actual automobile manufacturer in its own right by the German government (as their cars are built from Porsche chassis and modified before being sold). 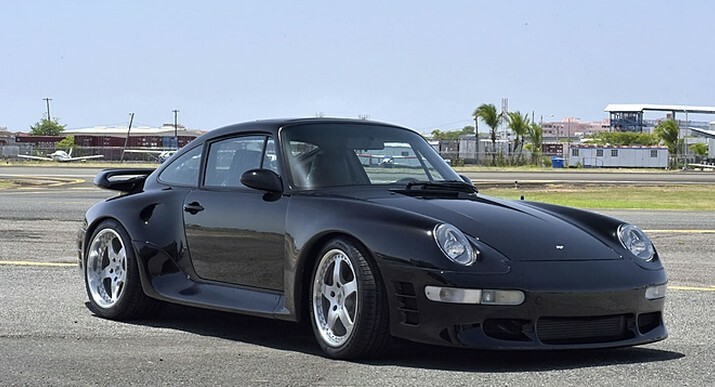 At any rate the CTR2 was the followup to the legendary CTR “Yellowbird.” The CTR2 was built between 1995 and 1997 and based on the 993-generation 911 Turbo. It is powered by a twin-turbocharged 3.6-liter flat-six making 520 horsepower. Geared to the moon, this car is good for over 215 mph. Only 16 CTR2s were built (with an additional 15 “Sport” models). You rarely see them, especially in the U.S. Supercar collectors, you need this. Click here for more info and here for more from Mecum in Monterey. This entry was posted in Uncategorized and tagged 1997, auctions, cars, ctr2, mecum, porsche, ruf, sports cars, supercars by classiccarweekly. Bookmark the permalink.